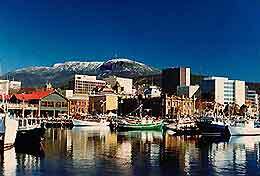 The lively city of Hobart is situated on the island state of Tasmania, just a short distance from mainland Australia. Tasmania's capital city, Hobart is famed for its friendly locals, exceptional climate and relaxed pace of life. With a historic convict past, evidence of Hobart's heritage is apparent at the nearby Richmond Gaol, while the waterhouses standing along the waterfront are also worth exploring, to gain an insight into the city's history.